I escaped the Colorado Cold and flew to Arizona for two fantastic days at the Tucson Festival of Books and, besides perusing the numerous tents full of authors and books, attended, let’s see, about eight workshops full of information about social media, publishing, marketing and speech-making. I got to listen to and meet two of my favorite bloggers, Chuck Wendig and Kristen Lamb! Now that I’ve met them, maybe I’ll be able to get them each to do a guest blog here. Are you reading this, you guys? Besides getting an education and being able to buy wonderful books at half price, this Festival manages to have yummy food vendors. I was there with my best friend from first grade (we are book lovers from way back), and we spied one of our most favorite foods in the whole world—Frost gelato! 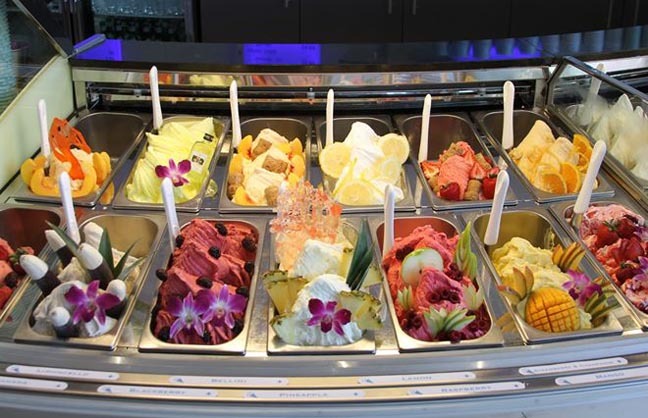 If you haven’t had Frost gelato, you are missing out on one of the great wonders of the world. This stuff is better than ice cream. Not only does it come in flavors one can hardly imagine, like tiramisu and Bailey’s cream vanilla, but it is lower in calories and fat than ice cream. But I’ll dare you to notice. This stuff is so rich and creamy. My favorite is sea salt caramel. How sad a person can’t get Frost everywhere. Although I discovered it is now in Albuquerque and Chicago, and there are lots of franchises in the Middle East. Wouldn’t you know. By the way, I do not own a Frost Franchise nor do I know anyone who does. I just love it. I must have inherited the ice cream gene from my mom. This entry was posted in Food, Musings, Uncategorized and tagged books, calories, festivals, food, gelato, ice cream, tiramisu, Tucson by Karen Lynne Klink. Bookmark the permalink.